Talk about waiting until the last minute. But better last minute than late, right? I’m just not one of them early types. Early bird gets the worm never applies to me. I’m wormless. No matter how hard I try I am always fashionably late. Hmm… what’s considered fashionably late before you’re rudely late? These are things I ponder when I am running late. Because if I know where the line is I can at least to tip toe around it. Obviously from the logo, I am talking about my second participation in Taste&Create event. My partner for this round is Alisa from One Frugal Foodie. I have to admit when I first browsed her blog I wasn’t sure how this would work. Let’s just say. I’m cupcakes and she’s health and fitness foodie living. Can you say opposites? But the first thing that popped out at my from her blog was a smoothie. 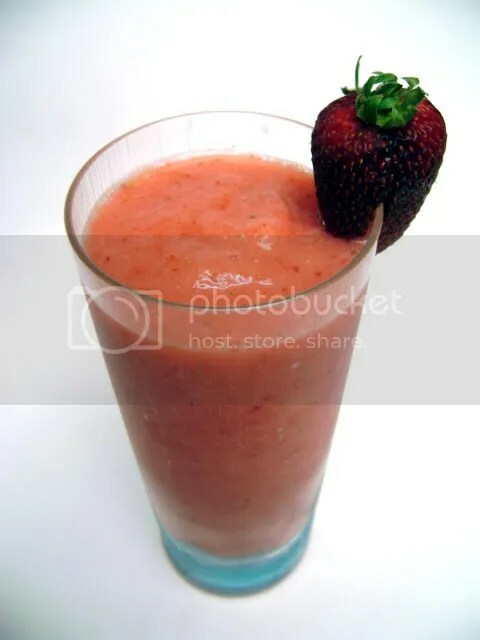 A strawberry smoothie. Now I’m a Californian. We’re all about Jamba Juice and Smoothies here. Thanks for inspiring me this month, Alisa! Combine the strawberries, water, honey, vanilla, ice, and salt (if using) in your blender and blend it to a nice smoothie consistency. Add more water or ice as you see fit. Add in the protein powder and just give it a few quick pulses to blend it in. I think if you aren’t a sugar addict like me, you’ll enjoy the refreshing strawberry flavor with a hint of sweetness from the honey but for me I wanted to add more sugar. But that still didn’t stop me from drinking the whole thing. Entry filed under: Taste & Create. Bunday Monday	TWD #66: Cooknie or Brownkie? Hehe, glad you enjoyed it even though my recipes are a little more on the healthy side! I guess that explains my dilemma with your cuppycake blog!